Cathodic Protection System is a technique used to control and prevents the corrosion of a metal surface. The simplest method to apply Cathodic Protection is by connecting the metal to be protected with another more easily corroded "sacrificial metal" to act as the anode of the electrochemical cell. Cathodic protection systems are used to protect a wide range of metallic structures in various environments. Common applications are; steel water or fuel pipelines and storage tanks; steel pier piles; ships and boats; offshore oil platforms and onshore oil well casings and metal reinforcement bars in concrete buildings and structures. Use of an external source of direct current opposing the corrosion currents, which thus greatly reduces and ideally eliminates corrosion. All objects to be protected are connected to the negative pole of a rectifier. The positive pole is connected to the anodes. If the potential on the protected structure is reduced to at least -850mV (against Cu/CuSO_4 reference electrode), corrosion can’t take place. These system have the effect of reducing the corrosion currents to the extent of cancelling the entirely, reducing the corrosion promoting oxygen in the structure’s environment and forming protective carbonate coatings. At this potential, the corrosion current is compensated by the impressed current. The metallic object the electrical circuit is cathode, this means, the noble electrode. The ions flow from the anode to the metal surface (cathode). Therefore corrosion can’t take place. For examples, a sacrificial magnesium anode is installed to prevent corrosion of the underground sections of pipeline and meter station. The magnesium anode is packed in a mixture of gypsum-bentonite and sodium sulphate to ensure a good anode-to-soil contact and low anode grounded resistance. 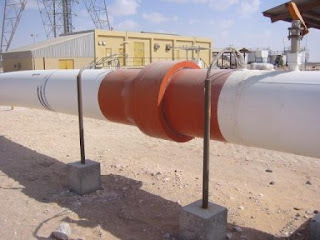 The anode is connected to the pipeline via above ground test post. Two cables is thermit welded to the pipeline. One is for pipe-to-soil potential measurement. The other is for connection to the anode feeder cables where output of the anode can be monitored.